Srinagar, March 08 (KMS): In occupied Kashmir, crippling strike was observed, today, to condemn India’s fiddling with the State Subject Law Article 35-A, ban on Jamaat-e-Islami, arrest of Muhammad Yasin Malik and other Hurriyat leaders under draconian Public Safety Act and intimidating raids by India’s National Investigation Agency in the territory. Srinagar, March 08 (KMS): In occupied Kashmir, Hurriyat leaders and activists held protest demonstrations in Srinagar, Budgam and other areas, today, against the detention of Jammu and Kashmir Liberation Front (JKLF) Chairman, Muhammad Yasin Malik, under Public Safety Act (PSA) and ban on Jamaat-e-Islami Jammu and Kashmir. On the call of Joint Resistance Leadership a large number of people including Hurriyat leaders and activists staged forceful demonstration in Hyderpora, Maisuma, Soura, Lal Bazar and other areas of Srinagar, today, and staged demonstrations. Islamabad, March 08 (KMS): The Chairman of Jammu and Kashmir Peoples Freedom League (JKPFL), Muhammad Farooq Rehmani, has strongly condemned the detention of Jammu and Kashmir Liberation Front Chairman, Muhammad Yasin Malik and spokesman of Jamaat-e-Islami of occupied Kashmir, Advocate Zahid Ali, under draconian Public Safety Act (PSA). Srinagar, March 08 (KMS): In occupied Kashmir, the patron of Jammu and Kashmir Mass Movement (JKMM), Farida Bahenji, and senior Hurriyat leader, Ghulam Muhammad Khan Sopori have said that the world is commemorating the women’s rights and prosperity, today, but the Kashmiri women are facing the humiliation every day. Farida Bahenji in a statement in Srinagar deplored that Indian troops had killed and subjected to custodial disappearance the sons, husbands, fathers and brothers of thousands of women in the occupied territory. Srinagar, March 08 (KMS): In occupied Kashmir, the Jammu and Kashmir Peoples League (JKPL) has expressed concern over the deteriorating health of illegally detained party Chairman, Mukhtar Ahmad Waza. A JKPL spokesman in a statement issued in Srinagar said that Mukhtar Ahmad Waza had been suffering from various ailments but he was not being provided proper medical treatment at Sher Bagh Police Station in Islamabad town. He said that the relatives of Mukhtar Waza were also not being allowed to meet him. Islamabad, March 08 (KMS): The Hurriyat AJK leaders held a protest demonstration in Islamabad, today, against the detention of Jammu and Kashmir Liberation Front Chairman, Muhammad Yasin Malik, under Public Safety Act (PSA) and ban on Jamaat-e-Islami occupied Kashmir besides India’s fiddling with the State Subject Law Article 35-A and intimidating raids by India’s National Investigation Agency in the territory. Srinagar, March 08 (KMS): In occupied Kashmir, the authorities for the second consecutive Friday, today, disallowed congregational Juma prayers at Historic Jamia Masjid in Srinagar. Srinagar, March 08 (KMS): In occupied Kashmir, Indian troops launched a massive cordon and search operation in Pattan area of North Kashmir’s Baramulla district, today. 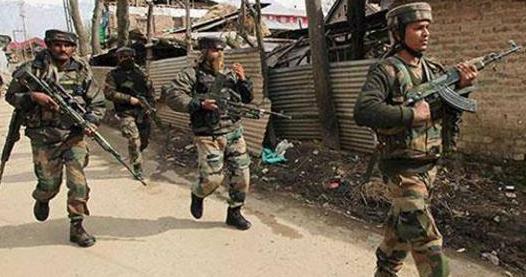 The troops cordoned off Palpora area of Pattan and conducted door-to-door searches, causing huge inconvenience to the local people. The operation continued till reports last came in. Islamabad, March 08 (KMS): As the world is observing the International Women’s Day, today, the miseries and victimization of Kashmiri women by Indian troops and police personnel continue unabated in occupied Kashmir.